I can only hope LBH and KTR will act again in a movie rom-com. After all, they're both movie actors. MR.SUNSHINE is a great drama up till episode 21. The ending is probably necessary for KES but it's a torture to endure and a trauma to remember. OMG, I really hated the ending where everyone dies except for Ae Shin. Why must Eugene die? If there is one person that I wanted to live, it is Eugene or Hui Seong and not Ae Shin. I am so sad and heart broken. So depressing without any ray of hope or sunshine of how people can live a full life in that depressing and turbulent period? How to mend my broken heart now? @rubie Just saw your wish. Yes, please I need another project for Lee Byung Hun and Kim Tae Ri where they will end up together to heal my broken heart. I had enjoyed camping in the forum throughout the 3 months of the airing of Mr Sunshine with fellow Soompi friends. I would like to thank everyone on this forum for the active and lively sharing and discussions that we had. Special mention to @rubie for the many updates, articles and photos shared and @mistymorning for the many updates, articles and translations shared. Nice meeting you here too. You know, now those words, see you and see you again.....will never be the same to me again. It will always remind me of Eushin and Mr Sunshine. Ugh! @rubie I feel the same...I also wish for the same...another project for them otherwise will forever remember this. @charray, @elfvanvan .. It may not mean anything but we need something to lift our spirits up after such a tragedy, right. KTR did very well in her debut drama but she is more a movie actress. Besides, it will be hard to top MR.SUNSHINE and her Lady Ae Shin character, especially. For LBH, this will probably be his last drama.. later, we don't know. He took the role because of KES and now it's even for both of them. Who knows.. maybe there will be another project of them together after all the 'limitations' in the drama. LBH had a good chemistry with co-star, CJW (in the drama Beautiful Days), so much so that they went on to act together again in a movie after that. My gratitude to everyone sharing at the thread, it's been an unforgettable three months of anticipating the episodes every Saturdays & Sundays and discussing our heart's content about the characters and their journey in the drama. Despite everything from the beginning it was announced to the ending of episode 24, MR.SUNSHINE is undoubtedly ONE OF A KIND. Raising the bar higher in Korean drama production and performance.. everything is top-notch in this delightful & memorable adventure to a traumatic destination. See you.. see you again.. in a non-depressing, non-torturous, non-traumatic project. Please. Heartbroken. Crying buckets ... even if I knew more will die. I was hoping for at least the 2 leads to fight side-by-side -- towards a brighter future for Chosun. Consoling myself with the fact that finally a great show that I enjoyed after a couple of years and will reminisce the good times with the past episodes. KES fooled me again -- SHEET! I'm not the only one who is crying isn't it ? DAEBAK! and again.. it's one of the best kdrama I've watched eventhough almost all the casts died in the end expect AeShin. But this drama has the best in my favourite. Everything. From the strong story. the superb acting from all the cast. the Cinematography it's incredible beautifully. the OST too woahhh I LOVE ALL THE OST in this drama. they deliver the feeling with a best way. eventhough it's just talk, gaze, or hug even they shoot each other. woahh It's incredible best in every scene. thankyou all the cast..all crew..writer~nim..pd~nim... for your hardwork for make this drama so great. my favourite kim eun sook's drama after GOBLIN. SEE YOU AGAIN. Well, I have just read the live recap and watched the final part.... the death of Eugene was not necessary. He was the reluctant hero of this story, he had an hard life and not even a kiss in exchange of his love’s sacrifice. All the deaths of the characters were unfair, but the one of Eugene is the most tragic. I will never watch again a drama by this writer... she seemed to just try to close the story in some way... I am left with the sensation she went for the mistreatement of her characters in order to shock the audience. It does not work with me, miss writer. I will always cherish the wonderful characters, full of humanity, but I will never come to terms with the ending the writer chosed for them. WHOA. They do read the tweets..
Well, it's only 'proper' so that it will be impossible for a Season 2. Period dramas and romance go together like Queen Bey and Jay-Z. Who can resist fantastic costumes, a historical setting, and a sweet flirtation between an unlikely pair? No one, obviously. So, it’s no surprise that Netflix was able to roll out Mr. Sunshine, a series about Eugene Cho (Lee Byung-hun), a Korean-born United States Marine Corps soldier who returns to his native land in the late 19th century and falls in love with a beautiful woman named Go Ae-shin (Kim Tae-ri). The final episodes of Season 1 will drop on Sept. 29 and 30, but Mr. Sunshine will not return for Season 2 because the entire series was only ever supposed to be this long, according to Deadline. The report confirms that Netflix acquired the rights to start streaming the Korean drama worldwide from production company Hwa&Dam Pictures and Studio Dragon. Netflix has been positioning itself to dominate the global streaming scene through beefing up their international show offerings recently with foreign-language series like The Rain, Dark, Undercover Law, and Deadwind. Mr. Sunshine was created by Kim Eun-sook and directed by Lee Eung-bok, who are both known for their international hit Descendants of the Sun and is currently airing in South Korea. Mr. Sunshine debuts two episodes a week, so Netflix is deviating from its usual "binge" style format to make sure the releases run in tandem with the regular broadcast. This allows fans around the world to get new material at the same time and avoid those pesky spoilers. And, it's a perfect time-frame for a summer mini-series because it will wrap up the story near the beginning of the fall TV rush on cable network as well as streaming services. So, if you want something to fill in that mini-gap in your TV schedule and make you get in your deepest feelings, then you should totally be watching this show. Mr. Sunshine actually didn't drop new episodes on the week of Sept. 16 because of the Chuseok (Harvest Mood Festival) holiday, per Rove.me. That means fans of the love laden series are beyond read for these remaining episodes following the holiday break. A glance at the show's Twitter hashtag reveals fans' bittersweet emotions about the drama thus far and the inevitable end of this saga. There was a massive explosion and cliffhanger at the end of Episode 22, so there could possibly be some major deaths to reconcile. Viewers tweeted about their their hopes, dreams, fears, and theories for how it will all end in the series finale. Mr. Sunshine may be ending soon, but it's visually stunning and melodramatic episodes are immortalized (sort of) on Netflix for future trips down memory lane. And, at least the show is able to have a definitive ending instead of leaving fans high and dry after a sudden cancellation. That's the beauty of a mini-series. Hopefully, this love story will deliver a finale that conjures up more heart-eyed emojis than crying faces. Good Bye Mr. Sunshine. It was a joy to go on the picnic with you. Thank You. 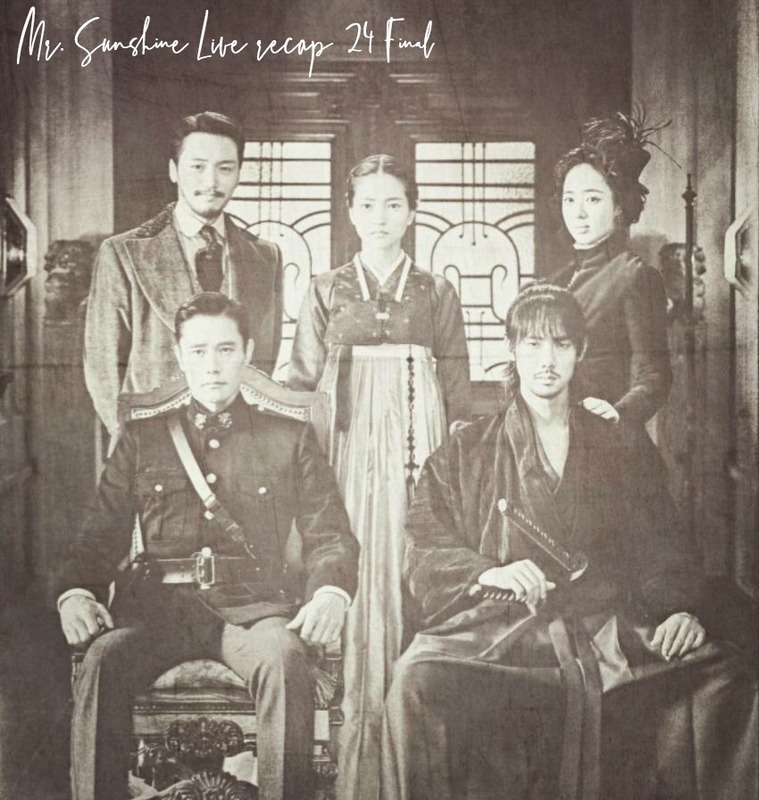 MR.SUNSHINE is a great drama up till episode 21﻿. Thank you for compiling the 'finale' group photos, @bedifferent.. it's truly the end now, huh. Grasping the reality now.. feeling drained and denial mode kicking in.. I couldn’t agree more chingu. Besides the ending I cannot accept, I’m also salty there was no kiss scene. @rubie I will be back with final thoughts and more photos. Letting it sink in. Thank you to you and many posters here for making the experience full. Truth be told, I am not a KES fan (the only work of her I have watched is Secret Garden) but truly this is a wonderful drama in many ways. It is one of 2018’s best and will be remembered for a long time. I wish them all the accolades and awards now and in future. Was my second time watching KTR and LBH (besides Forest and Inside Men). Eugene was the soul of this drama, given that everyone has repeatedly said AeShin is Joseon’s spirit. A well written and acted character so I am glad LBH gave him life. I had anticipated this.. went thru same ending tht left me shocked and disappointed... a chinese drama "seige in fog".. died just few minutes before drama ended!! Aeshin an Qin Sang have almost similar personality and both finally were left alone as the men around her ALL DIED! One man stood tall touched, taught and inspired a boy about having courage to never be afraid to fight for whats right. LBH, I always know you're a great actor, but you again and again proves it. Sometimes it's too much that I need to remind myself you're fine in real life. Please don't choose tragic ending in your future project after the next one. And my beautiful Eugene Choi, hope you reincarnate in another life and have a normal life with Go Aeshin, your love of life. Crying whole lot at the moment, but I would like thank all of you, to watch this drama til the end together. And now that my emotions are sort of leveled out, I thank KES and production staff, actors and actresses for this drama. Any other ending would have been a cop-out. ( except I have issues with music director or director with BGM choice at the last scene ). Hope to meet you all again in happier project! This was a drama-of-a-lifetime. I was glad to be part of this thread. Nationwide ratings for episode 24 (finale): Currently unavailable as of 12:07PM PST, I'll update it once Nielsen is publishes them. 1. [+11650, -27] Thank you to the ancestors who sacrificed their lives for the country... And thank you to the actors for their enthusiastic performance..
4. [+3556, -30] It was sad and tragic. 5. [+2465, -109] Aren't they hanging the flag up backwards because the country was robbed? The day we take it (the country) back, the country will stand straight and the flag will stand straight.. Do you think they did that without knowing? In this type of masterpiece..
6. [+1591, -4] The thing I liked the best about this drama was the part where not only did they make a detailed reference to the Five Eulsa Traitors but also the Seven Jeongmi Traitors. I think that many people probably don't exactly know the Five Eulsa Traitors and probably don't know the Seven Jeongmi Traitors even more. Instead, I think it's important to take shameful history and teach us not to repeat that. 7. [+1572, -8] This was the best drama of my life.. It was more vivid, beautiful, and heart-aching than any historical movie. While watching the drama, it was my first time thinking about the country. The actors' acting.. And the cinematography plus the directing and the subject matter.. It's a work of art that won't exist again!! Bravo!! 3. [+407, -2] Only Ae Shin survived but Yoo Jin, Dong Mae, Yang Hwa, and Hee Sung are all precious and are all alive in my heart. Starting from Righteous Army leader Hwang Eun San to Gunner Jang, Haman-daek, Haengrang, and all the Righteous Army members whose name we don't know, thank you. Those people are the history itself.. Goodbye.. See you again..
5. [+237, -1] I think it'll be hard for me to re-watch the last episode. Because my heart hurts..
@misspiggie your last comment I had to lol even though I was still traumatized by the ending. I am more convinced that I should never finish another KES drama. I never did actually until Mr. Sunshine. I know it would be a sad ending but not this tragic epic death of a favorite character. Is it too much to ask for the two of them stay together fighting for the cause and groom the future resistance babies like Ae Sin's parents did?